A MASSIVE £69.2m road scheme designed to solve 20 years of congestion around the Cooper Bridge roundabout in Mirfield has been unveiled by Kirklees Council. 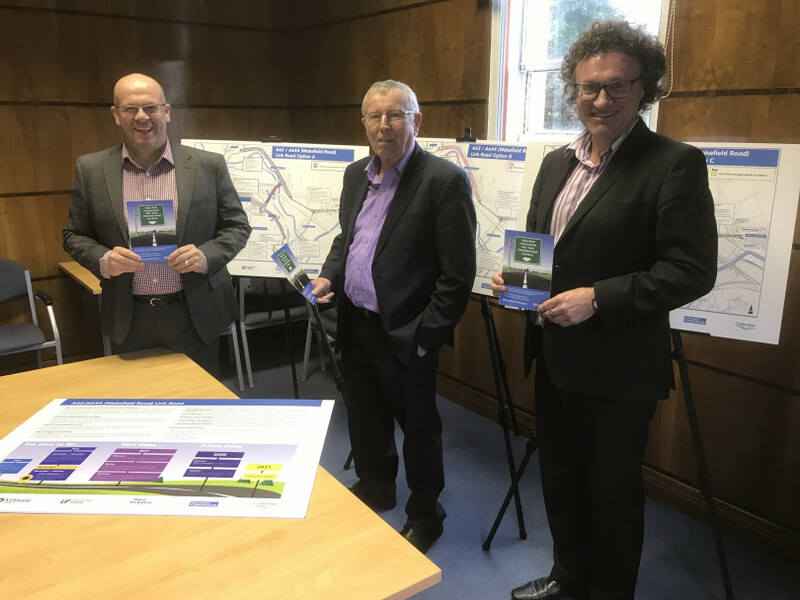 Transport chiefs and planners say the “ambitious and transformational” project will involve the creation of a new relief road and viaduct in the Bradley area of Huddersfield. The scheme, paid for by the West Yorkshire Transport Fund, provides 1.5km of new road and changes to 2.5km of current highway. It aims to reduce traffic on the A62 Leeds Road and the A644 Wakefield Road, cut journey times and improve air quality. The plan, to begin construction in 2021, will involve the purchase and demolition of some homes as well as buying up surrounding “virgin” land. Around 50 landowners – including householders and businesses – have been contacted. A council spokesman said: “There are approximately 50 landowners who could be affected by one or more of the options in these proposals. “We have contacted everyone who could potentially be affected and at this stage we’re only anticipating that we would need less than a handful of properties in their entirety. Oddly, a large part of the main junction actually resides in the Liversedge and Gomersal council ward but is traditionally thought of as part of Mirfield. As well as a 450m-long viaduct on the Huddersfield side traversing the railway, the Calder and Hebble Canal and the River Calder, further improvements include widening Wakefield Road between junction 25 of the M62 and Cooper Bridge. Planners are putting forward three options, including a “big build” involving a dual carriageway to the M62. The scheme is a partnership arrangement with Calderdale Council and has been designed to complement further developments on the other side of the M62, particularly around a major housing plan in Clifton. Inevitably, extensive works will involve disruption to commuters. Mirfield councillor Martyn Bolt has successfully lobbied Kirklees officials to have digital signs installed on the roads around Cooper Bridge to alert drivers to the plans and information leaflets are being delivered to shops and community venues in Roberttown and Mirfield. The spokesman added: “With thousands using this route every day, we know that people will be worried about the roadworks during construction.Whilst it would be impossible for us to make such a big change without there being some disruption, we will work with the contractor to make sure it is kept to a minimum. “We’ll have more details on this nearer the time, but already we know that the work will be done in phases rather than all at the same time and that some of the biggest parts of the scheme will be built alongside existing roads or on vacant land, so won’t affect current routes. All the options can be viewed at www.kirklees.gov.uk/majortransport and the survey is open until January 18, 2019. Drop-in events from 3-7pm will be held on January 7 at The Roberttown (former WMC), Liversedge, and January 8 at Battyeford BC Pavilion, Mirfield. An unstaffed exhibition will be open in Huddersfield Library until January 18.